The creative talents of the greater cycling community convened in Salt Lake City this spring for the North American Handmade Bicycle Show (NAHBS) to showcase works of rideable art. Motivations and designs differ greatly across builders, but their passion for the sport is as hearty as the materials they choose for their stately steeds. Riding through the streets of SLC, it is often difficult to spot a handmade bicycle from afar, so take a closer look with four locals—Sixth Law Cycles, Saltair Cycles, Reynolds Cycling and Métier Vélo—who are constructing these two-wheeled dream machines. SLUG: Briefly describe the backstory behind your brand. Reynolds Cycling: We started out in the 1990s and revolutionized the world with the high-end Ouzo CarbonFork. We also brought to market the first carbon clincher wheelset. Reynolds Cycling’s designs, molds, production techniques and processes have created an industry and continue to lead it. SLUG: Why did you decide to choose Salt Lake City as your home base? Reynolds: Salt Lake City has it all, with an educated workforce, reasonable costs and amazing access to the mountains. Living at the base of the Wasatch Mountains is a huge benefit to ensure we employ a team that not only builds carbon wheels but uses (tests) them too. SLUG: How do you engage with the local cycling community in SLC? Reynolds: Reynolds loves to support the local athlete as well as the everyday cycling aficionado. We participate in Utah trail preservation groups and local cycling tradeshows as well as sponsor a number of local athletes. We are cyclists living in Utah, riding in Utah, and tout the many beauties and benefits of this state. SLUG: How many people work within your company and how do you plan to grow your business? Reynolds: We have about 40 people at our headquarters in Sandy; this office focuses on engineering, R&D, testing, production, sales and marketing. Company-wide, we have about 300 employees in cities around that world, including: Maastricht, Netherlands; Hongzhou, China; and Taichung City, Taiwan. SLUG: What is the most difficult part of building a bicycle or components by hand? 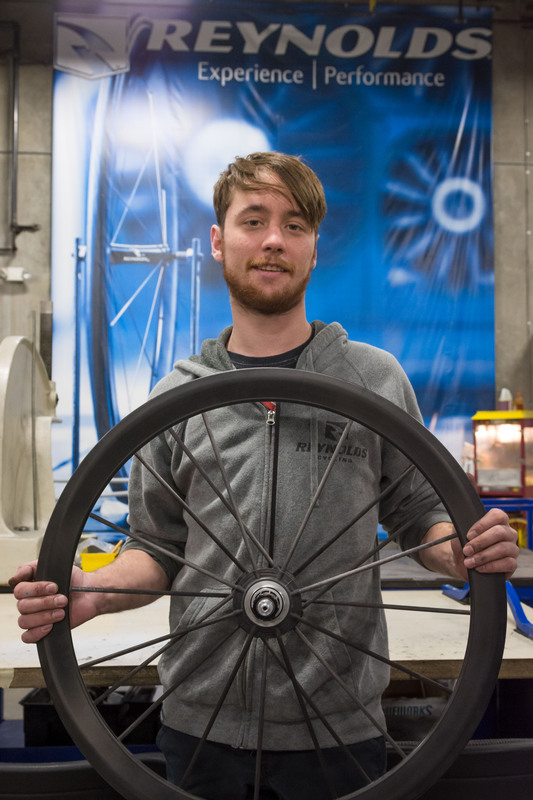 Reynolds: Laying (building) carbon fiber, particularly cycling wheels, cannot be automated. It is a very time and labor-intensive process that our employees have crafted from many years of experience. Each wheel actually takes many hours to mold, bake, cool, drill, assemble, true and test. SLUG: What have been some of your biggest triumphs as a builder? Reynolds: We have led the industry on engineering, durability and wheel-design since the ‘90s. Our wheels are included on some of the best bikes in the market and often replicated. SLUG: How do you attract potential customers? Reynolds: When potential customers test our wheels, they become customers. We have a great program called Ride-to-Decide that allows customers to take our wheels out for a spin from one of our retail dealers. Once customers put our wheels on their bike and feel the difference, they take them home. It’s as simple as that. SLUG: How do you set yourself apart from other custom builders in the area and abroad? Reynolds: Our legacy of building the best wheels on the market has been our differentiation. We have refined and tested our wheels so many times over the years that it would be hard for other wheel builders to replicate. Engineering, engineering, engineering—we have amazing NASA aerospace engineers that design AND ride our wheels. Makes for some amazing, technologically advanced wheels. SLUG: Tell us about your 2017 NAHBS experience. Was it your first show or have you been going for a while? Reynolds: We had an awesome time at NAHBS this year. It was in our backyard! We hosted a taco party and fundraiser for the Huntsman Cancer Institute at our HQ, and we were able to raise over $3,500! It was a nice evening to hang out, talk about bikes and raise money for a great cause. We have been a part of NAHBS in the past, and I am sure we will be in the future. The bikes that are shown at this event are nothing short of amazing. SLUG: What kind of products did you showcase at this year’s NAHBS? Reynolds: We had a mix of our current wheel line and custom bikes from builders in our booth. Having those custom bikes is a great way for us to highlight some of our relationships with various builders. SLUG: How has your local connection sustained your brand over the years? Reynolds: Utah is an amazing market and the unofficial capital of road and mountain biking in the U.S. The local Utah connection has far-reaching advantages. Focusing our efforts on local cyclists has been a great area of growth for us. SLUG: As a larger company in a niche market, how do you use your production capabilities to your advantage? Reynolds: Again, history and legacy. We’ve been around for a long time, and this aspect is hard to replicate. Our carbon layers and wheel builders are some of the best there are … period. We’re always looking for new ways to refine, build and test our wheels to accommodate the ever-changing cycling industry. Reynolds is able to respond quickly to the market because we’re cyclists that also happened to work at NASA. SLUG: What innovations in the cycling world are most appealing to you at this stage in your company’s life cycle? Reynolds: Carbon fiber technologies are always evolving, which has forced everyone in our industry to keep pushing further and harder. 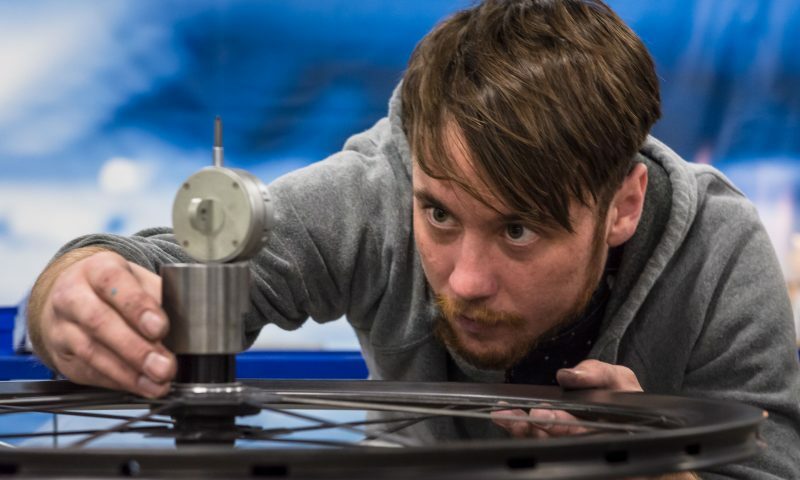 It is very exciting to see new developments and how we can continue to build the best wheels. SLUG: How do you foster creativity as a company, and how does the design process take shape from prototype to production? Reynolds: We are a bunch of bike nerds, so we don’t consider a lot of this work, but pursuing our passion. Staying on top of industry movements is both exciting and critical to producing a product that people will want. Most of the time, we are thinking about products with our bike partners 2–3 years down the road. It really is great to work in an industry that you love!